The development of social gerontology in the 1930's took place without giving much special attention to ethnic minority peoples. The concept and reality of age is experienced in different ways in differing cultures. This reality is now accepted by researchers in developed countries and has brought to light the importance of aging issues in ethnic minorities. However, the topic has not yet entered the mainstream of Bangladesh scholarship and remains as a relatively new phenomenon. 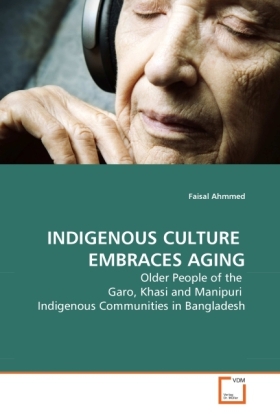 "Indigenous Culture Embraces Aging: Older People of the Garo, Khasi and Manipuri Indigenous Communities in Bangladesh" fills this gap by analyzing the plight and requirements of the ethnic or indigenous elder peoples of Bangladesh. It is assumed that the ethnic peoples are neglected, backward, discriminated and excluded from the development activities and services in ways similar to the majority elderly population. However, this assumption ignores the fact that the elderly ethnic minorities experience unique and severe problems. This book explains how their situation has become more critical than that of the majority elderly population of Bangladesh.